It would be nice to have a large master bedroom with plenty of space to spare, but the fact is that many of us don't. In fact, many homes and condos have very small bedrooms that can barely fit a bed and a chest of drawers. But just because a room is small it doesn't mean that there aren't plenty of great decorating opportunities. Take a look at these photos of small bedrooms. Some are bigger than others, but none would be considered particularly large. It just goes to show that size doesn't matter. A small bedroom can be remarkably stylish and efficient. This bedroom isn't tiny, but it's not huge either. The combination of colors and patterns on the wall draws they eye up so you don't notice the somewhat limited floor space. 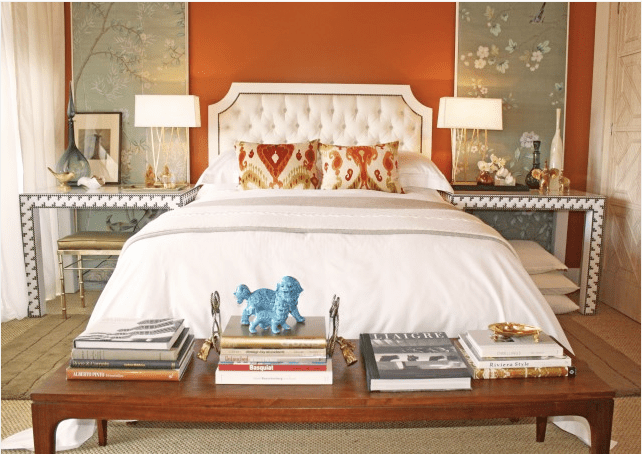 A bedroom, no matter what the size, should express the personality of those who live there. This small bohemian is full of fun and personality. If your look is romantic and pretty you can still achieve it in a small bedroom. This room demonstrates it beautifully. When you live in a small space keep your accessories to a minimum. This room has very few extras which keeps it from looking cluttered. A white color scheme isn't just fresh, it's calming. Carved details and fabric embellishments add depth and keep it from looking boring. A no-fuss, frill-free room is ideal for a small,contemporary space. This room is feminine yet it's free of frills. Mirrored furniture and a soft color scheme help to make the room feel enlarged. This room demonstrates that you can have a big impact in a small space. The combination of salmony pink, soft blue and white is both soothing and interesting. When in doubt, add a little sunshine. Yellow and white is a great color scheme for small space because it's bright and not too heavy. A bold pattern on the walls distracts from how small this room really is. Don't be afraid of using patterns in a small room. This room ban barely fit the bed yet it looks large and inviting. Streamlined furniture and a light and fresh color palette makes this room seem bigger than it is.